District House vendors have not yet announced opening dates. Officials had said they would open during the fall semester. 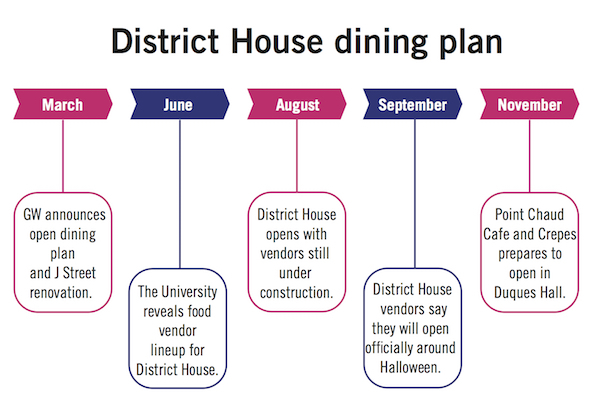 Months after the opening of District House, the vendors in the residence hall’s basement have yet to open – leaving students without dining options they thought they would have this semester. 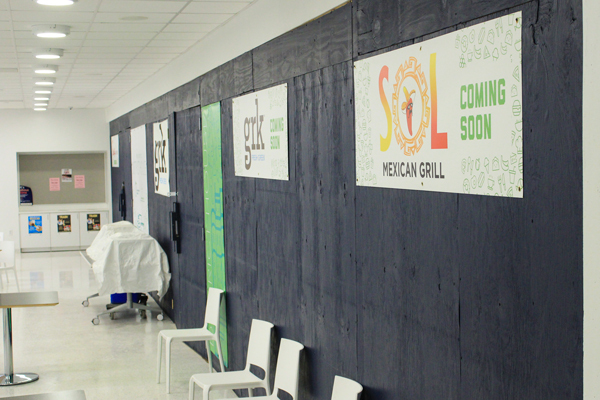 Two of the building’s six vendors are set to open in the coming weeks, but others won’t be ready until next semester. Students said they were under the impression the eateries were supposed to be open this semester, and with little information about the opening dates and a closed dining hall, they have fewer food options than expected. Officials have pointed to the new restaurants as replacements for J Street, the only dining hall on the Foggy Bottom Campus that closed over the summer. At the same time J Street closed, GW transitioned to an open dining plan, meaning that students were given a certain amount of dining dollars to spend at partnering restaurants, convenience stores and grocers. University spokesman Brett Zongker said vendors are not yet able to provide a concrete opening timeline and that the eateries will open on a rolling basis. “Due to the process involved, vendors have not opened as early in the semester as both GW, our students and the vendors had hoped. We do continue to expect that some of the vendors will be open prior to the end of the semester,” Zongker said. Chick-fil-A, GRK Fresh Greek and Sol Mexican Grill are among the District House vendors announced over the summer. As of now, none are open. Wiseguy NY Pizza and Beef n’ Bread are currently in the final stages of their D.C. government inspections and are expected to have soft openings “in the coming weeks,” with extended hours later this academic year, Zongker said. Zongker added that vendors are responsible for the design, permitting and construction of each of their spaces. He said officials are working closely with vendors and that they set the expectation in the retailer contracts that vendors should open as soon as possible. The University is also starting a new “Meal Deals” program in which students can purchase $6, $8 or $10 meals at some of GW’s dining partners. Fourteen vendors, including Beefsteak and Carvings, are currently participating and University officials are “actively recruiting” more vendors to participate in the spring, Zongker said. These deals will also be available at each District House vendor. Zongker said plans for a new dining venue to open in the former J Street space of Marvin Center are still on track for the 2017–2018 academic year. And construction on Point Chaud Café and Crêpes, which is expected to open in January to replace the shuttered GDub Java on the first floor of Duques Hall, has already begun. Zongker declined to comment on any specific deadlines in vendor contracts, whether there has been a decrease in dining dollars spending due to the open dining plan or how students who planned to work in District House vendors are being supported. Student Association President Erika Feinman said the opening dates for each vendor don’t fall under GW’s responsibilities and are instead up to the vendors. “At the end of the day this comes down to how fast each individual vendor decides that they want to move on opening their location,” Feinman said. Feinman added that students who feel they are not provided with sufficient nearby and affordable options should take advantage of local GW food partners and the “District Days” program, where students can buy $8 meals from GRK Fresh Greek and Sol Mexican Grill on weekdays from noon to 2 p.m.
Sara Merken, the president of GW Food Recovery Network, a student group that collects food for local shelters, and a former Hatchet columnist, said the lack of dining options has affected freshmen most. Merken added that students are less secure about their food options because of the delayed vendor openings. Officials helped to start a student-run food pantry in the basement of District House earlier this year to address some of those issues, which experts said may have be a “Band-Aid solution” to a greater food insecurity issue. Kim Robien, an associate professor of exercise and nutrition sciences at the Milken Institute School of Public Health, said GW’s decision to lease District House space to vendors instead of creating another dining hall limited the potential for healthier food options. By going with outside groups, officials ceded their oversight on what meals are offered and how nutritious they are. “When a university contracts with food service providers for it’s own dining spaces such as West Hall on the Mount Vernon Campus, the university can stipulate that a certain amount of healthier food options, such as low calorie or low sugar options, be made available during the contract negotiation process,” Robien said.